– Older interviews now and Mark (@NoCrowdsurfing) has a Flickr treasure trove of mostly UK music press interviews and reviews with and of the band back in the day. It is time for a gratuitous World Cup tie-in to fill the pre-July concerts hole in our blog schedule. As far as I know, only Mike Patton from the band is a major football fan (Mike is an AC Milan fan by the way) but Faith No More have made some soccer/football associations over the years. Fittingly for a World Cup in Brazil, the band have emerged as fans of Palmeiras, the famed São Paulo club that has boasts Émerson Leão, Rivaldo and Cafu as past players. The band first made their Palmeiras affections known at the 1995 Monsters in Rock festival when Bill Gould wore a Palmeiras shirt on stage. And the group have also worked Palmeiras chants into their Brazilian performances. A fully realised one here in 2009. And the band’s support has now resulted in the production of a limited-edition Faith No More/Palmeiras shirt from one enterprising Palmeiras merchandise outset. You can buy here but I think delivery is limited to Brazil. Of course, if anyone based in Brazil would like to get one and send it on here that would be greatly appreciated. Not that the band’s support for Brazil is guaranteed over the next few weeks. In fact, Mike P has sported an Argentina jersey on stage on the reunion tour. 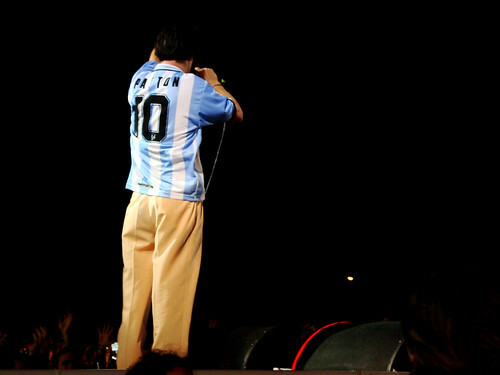 The number 10 shirt of Maradona, Kempes and Messi was given a Patton makeover when Faith No More played Buenos Aires in November 2009.